Habib Ahmed: a time to die, for immortality! 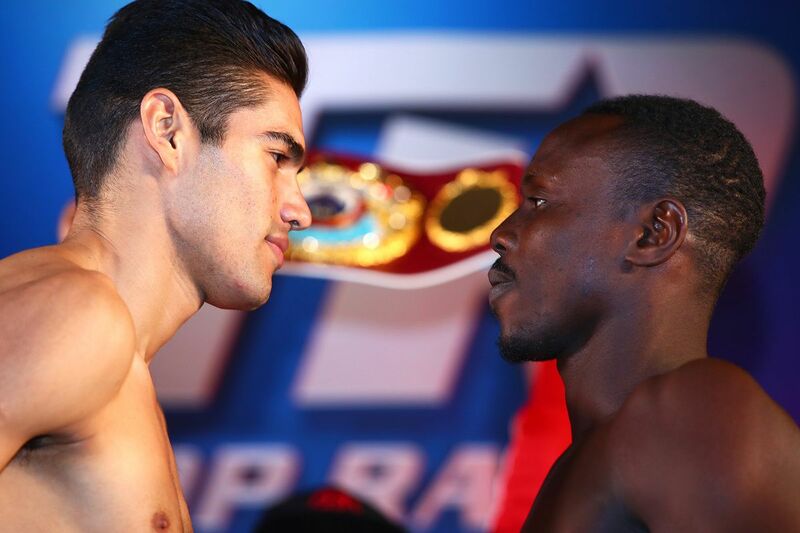 Ghana’s relatively obscure world title hopeful, Habib Ahmed, sets out to make nonsense of his seeming impossible task of stripping Mexico’s Gilberto Ramirez of his WBO super middleweight title at Corpus Cristi (literally the Body of Christ), Texas, tonight. In what could be termed a poor man’s version of the historic Ike Quartey-Espana Crisanto mega-clash in Paris on June 4, 1994 for the WBA welterweight title, tonight’s scheduled combustion has pulled Ahmed from obscurity to the verge of historic opportunity offered him by Top Rank Promotions. For, not only would the bout itself introduce him to the world; in the event he wins, that would be his arrival into the spotlight at a time when Ghana boxing is on a renaissance, following recent exploits by compatriots, lightweight Richard Commey and super bantamweight Isaac Dogboe knocking on the doors of super stardom. Even more significantly, it would be the first time any Ghanaian would have captured a world title at a heavier weight. For the record, Ghanaian world champions have spanned the bantamweight and welterweight divisions, with Ike Quartey and Joshua Clottey topping the weights. In terms of significance, though, Hall of Famer, Azumah Nelson is a colossus towering over all compatriots who annexed the various world championships, beginning with David Kotei, aka Poison, who set it off on September 20, 1975 by capturing the WBC featherweight title from Mexico’s Ruben Olivares. So, indeed, Ahmed’s quest is a major undertaking against the taller, southpaw champion blending grit with glitz demonstrated by his fast hands, explosive power in both fists, great chin and a very aggressive fight style reflected by his 67% knockout rate in his unblemished fight record of 36-0 (24 KOs). That resume is certainly one to shrink any foe’s spirit. Yet, Ahmed sounds almost dismissive of his opponent, albeit admitting “I have not been sleeping, just constantly thinking of this fight. “But I’m ready, I’m ready,” he asserts, in a recent interview with a section of the media in Ghana’s capital, Accra, from where he relocated to the USA to prep for his momentous opportunity. Now that the time is here, and the prize is near, Ahmed has no choice but to deliver. Still, the odds seem stacked heavily against the longshot Ahmed. To begin with, though Ahmed wields a similar knockout rate, 25-0-1 (17 KOs), the Ghanaian contender has fought fewer and low-magnitude fights. In April 2016, Ramirez dominated and dethroned long-standing Armenian super middleweight champ, Arthur Abraham. Then, last September, he decisioned previously unbeaten American Jesse Hart (then 22-0, 18 KOs), who fights Ghanaian Thomas Awimbono, on the undercard, tonight. Still, similarities exist between Ahmed and Ramirez. While the 27-year-old Ghanaian seeks to become the first Ghanaian to win a world title at that weight, the 26-year-old Mexican, Ramirez marked that territory when he decisioned Abraham. Also, given the fearsome reputation garnered by Ramirez compared to the relative obscurity of Ahmed, a certain comparison does exist between Ahmed’s aspirations and a former compatriot, Ike Quartey, who dared enter the same ring to battle the imposing frame of Venezuelan Espana Crisanto. Crisanto (then 29-0-0 with 82% knockout rate) was the goliath terrorizing, brutalizing and sacrificing hapless challengers in the welters to the gods of boxing. Yet, Ike Quartey, with fists that could shake a skyscraper, did cause an earthquake in the Parisian ring. After enduring the heavy assault of Espana, Quartey unloaded 14 unanswered bazookas that upended Espana like a log, to annex the title, and write his name in the history books. That is the promise Ahmed holds. Still, most experts deride his chances, comparing him to the ilk of Uganda’s John Mugabe who dared enter the same ring with the legendary middleweight ruler, Marvin Hagler, ending up upended like all the vanquished pretenders before him. Unfortunately, that is the hand dealt Ahmed, who has no choice than to execute the impossible in the ring in order to announce a new order in that weight division. Indeed, Ramirez is a legit fighter with polished boxing skills who has the knack for ending fights before the scheduled 12-rounds, ironically a trait shared by Ahmed. Therefore, the potential for a knockout in tonight’s pas de deux is a certainty either fighter can effect. However, for Ahmed, it is an imperative. For, nothing short of a knockout of Ramirez would grant him the coveted prize of recognition as the new champion of the w-o-r-l-d of WBO super middleweights. That would increase the number of Ghanaian world champions, with Emmanuel Tagoe currently the only world champion wielding the IBO lightweight title. It is a time to die – even through great pain and anguish – for Ahmed to gain immortality as a champion of the world, a la David Kotei, Azumah Nelson, Nana Yaw Konadu, Ike Quartey, Joseph Agbeko, Joshua Clottey, who defied hostile crowds in foreign lands to make the impossible possible. Go, Ahmed. Go, Ahmed. Go! Go, Ahmed. Go, Ahmed. Go into the ring to pay the price to gain the prize of immortality, and add to the lustre of the hallowed realms of Ghana boxing.